At some point soon I intend to research all of Pitt's godchildren, wards, and others named after him. Suffice it to say, Pitt was a godfather from the age of 14, and his love of children was well-known. One such child named in honour of Pitt was Pitt's last private secretary, William Dacres Adams's son, William Pitt Adams. Born whilst Adams was Pitt's secretary, the boy's godmother was Lady Hester Stanhope (Pitt's niece who was then living with him). William Pitt Adams died at Lima, in Peru, in 1852, pre-deceasing his father by ten years. 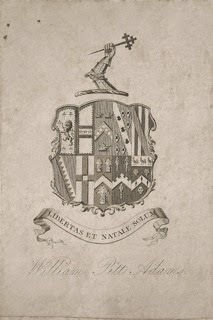 Yet his bookplate remains, and is of interesting historical significance. A man named Chris Kearin recently got in contact with me, and kindly allowed me to share a scan of William Pitt Adams bookplate here on the site. He explained that he came across it in a copy of John Lloyd Stephens's Incidents of Travel in Central America, Chiapas, and Yucatan, which was published a decade or so before Adams died. The copy (which he obtained from an estate sale in suburban New York) seems to have wandered around a bit; it bears a later owner's inscription indicating that it was in the Yucatan in 1927. It's a two-volume work and the bookplate is in each volume. One of current topics on my research agenda is to track down one of Pitt's original bookplates. I believe there is at least one at Chevening, and perhaps also in other private collections. It would be fascinating to hold a book that once formed part of Pitt's private collection at either Downing Street, Holwood, or Walmer Castle. Many thanks to Chris Kearin for granting permission for me to share this bookplate here. This is a beautifu memoir to William Pitt. You have a way with words, have you considered offering a service paper. That just might be your forte. you have shared amazing stuff about about william pitt, i really enjoyed to read your blog, a lot of appericiation from my side, thanks for sharing with us, keep it up.